The conflict has taken a toll on the civilian population as well as combatants beyond the numbers of deaths. Amongst the top sufferers of psychological trauma related to conflict are rural women. 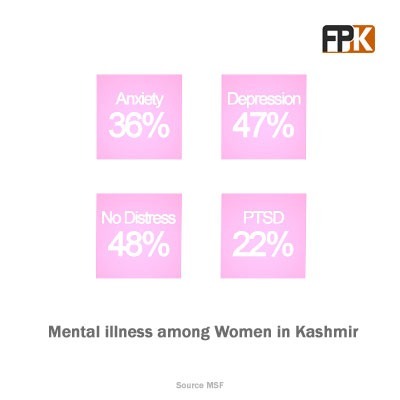 Data suggests that Kashmir is not only the world’s most militarised zone, it is also the most depressed. Over 45% of adults living in the valley are suffering from mental stress. Post Traumatic Stress Dissorder (PTSD) rate is the highest found anywhere else in the world. Here are some visualisations to help you gauge the scale of the issue. Qazi Zaid, Shadab Nazmi, and Sheikh Saaliq worked on this project as part of Global Editors Network’s hackathon in partnership with Bill & Melinda Gates Foundation, Hacks/Hackers India and the International Center for Journalists with the support of the New Venture Fund for Communications.